The new Sony native 4k HDR projector is now available. Offering not only fantastic 4k native image but also utilising HDR to it’s full potential. Available now but stock is limited so please call us to order. Full ISF/THX calibration is available. Advanced SXRD panel technology delivers incredible 4K images with four times the resolution of Full HD. 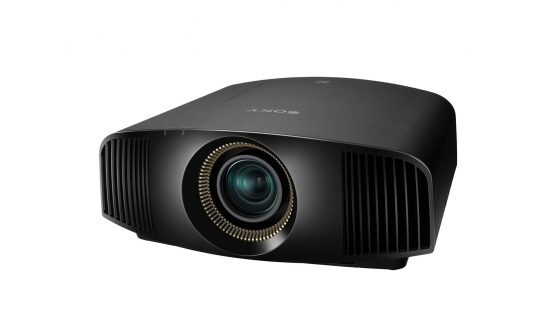 You’ll experience rich colours, impressive 1800 lumens brightness and huge 350,000:1 dynamic contrast ratio – for vibrant, detail-packed pictures with native 4K resolution that always look clear and sharp, even in daylit living rooms. You’re future-proofed with compatibility for the latest 4K standards, as well as compatibility with HDR (High Dynamic Range) – so you’ll get the very best out of today’s content, and tomorrow’s. Colour can be easily calibrated to the original factory condition without fuss. The compact VPL-VW550ES fits neatly into any home theatre or living room, with quiet fan noise that won’t disturb the show, wide zoom/lens shift range and a front-facing exhaust port for extra installation flexibility. The projector’s long-lasting lamp is rated for an extra-generous 6,000 hours* operation (in Low Mode), for fewer interruptions and reduced maintenance costs.